Two consecutive years of playoff defeats at Wayzata’s hands were more than enough to fuel the Edina on Wednesday night. The Hornets’ flattened Wayzata 8-1 in the Class 2A, Section 6 championship game at 3M Arena at Mariucci. No. 2-ranked Edina (26-2) built a 3-0 first period lead on goals from Demetrios Koumontzis, Ben Brinkman and Max Borst. The early surge flipped last season’s script, when Wayzata scored 25 seconds into the game and ultimately upset second-ranked Edina 3-1. Urgency carried over to the second period as Nevers scored just 40 seconds into the frame. His goal was Edina’s fourth on just eight shots. Colin Schmidt got Wayzata on the board with a shot from just inside the blue line. His efforts cut Edina’s lead to 4-1 but didn’t stop the Hornets’ assault on the net. They closed the period with three goals in exactly five minutes. Jett Jungels, who skates on the Walker-Nevers line, scored twice on the power play. After two periods, Edina led 7-1 and triggered running time for the final period. Edina goalie Garrett Mackay stopped 16 of 17 shots faced. No. 7 Wayzata (16-11-1) was the two-time defending section champions. The Trojans fell to Lake Conference foe Edina twice earlier in February. Edina has lost just twice all season and only once in 2018. “Everyone was ready and came out with the mentality that we weren’t going to take no for an answer,” Walker said. 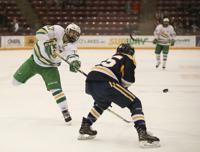 Two consecutive years of playoff defeats at Wayzata’s hands were more than enough to fuel the Edina boys’ hockey team. The Hornets flattened Wayzata 8-1 in the Class 2A, Section 6 championship game Wednesday at 3M Arena at Mariucci. No. 2-ranked Edina (26-2) built a 3-0 first period lead on goals from Demetrios Koumontzis, Ben Brinkman and Max Borst. The Hornets added four goals in the second period, starting with Mason Nevers just 40 seconds into the frame.